The texture of the breadcrumbs is really delicious on the ham and makes for a very attractive option. Allow to simmer for about 2 hours and turn off the heat allowing the Ham to cool for approximately 30 minutes in the boiled water. Remove the ham from the pot and score diamond shaped lines into the fat. Next mix together the fresh breadcrumbs, mixed herbs and wholegrain mustard. Spread this mixture over the whole ham ensuring that the ham is covered. Remove the ham from the oven and allow to rest for an additional 10 minutes before slicing. Peel the potatoes and place into a large pot filled with water and bring to the boil. Meanwhile bring a separate saucepan of salted water to the boil and plunge in the shredded cabbage and cook for 3-4 minutes until just tender. Strain off the water and leave the cabbage under running cold water until it has cooled down. Once the potatoes are boiled strain off the water. Then add in the butter, milk and a little salt and pepper and leave to steam for a minute or two. Mash the potatoes until creamy and then add in the shredded cabbage and the chopped scallions and mix well until the cabbage has completely reheated. Add in the nutmeg (if using) at this stage. 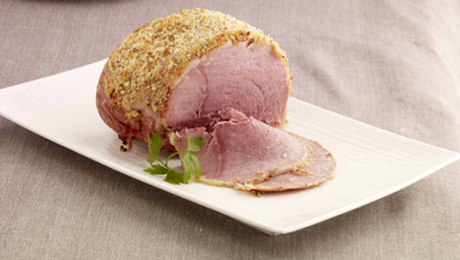 Serve immediately with the herb crusted baked ham. Lovely meal very filling and tasty my little one wont eat cabbage so just put plain mash aside before adding this to hers also steamed some carrots to have a second veg.